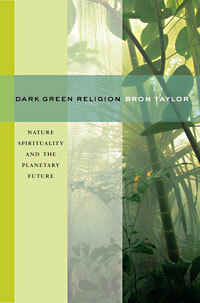 In the 'Readers Guide' to Dark Green Religion, Bron Taylor mentioned that he would establish a website to provide the unabridged notes that further illuminate the phenomena discussed in his book. In this "supplementary materials" domain you will find these notes, which are provided by the chapters in which they appeared in the unabridged manuscript. Also in this domain you will find video, sound, slideshows, which provide a visceral feel for the phenomena described in the book that words alone cannot express. Since another motivation for creating this website is to continue the exploration undertaken in the book, additional examples will continue to be added. These include a special section devoted to the motion picture Avatar, which can be understood as an exemplar of dark green spirituality. Bron Taylor is directly managing this part of his website and will provide commentary throughout these supplementary materials pages. Here he is expanding on the work in the book. He has also created a space for some of his favorite sounds and images that illustrate the book, as well as for reader responses and reactions. Additional information pertinent to the book can be found in opinion and perspectives Taylor has written for newspapers and other popular venues. Also available are various interviews he has given, as well as interview-related newspaper and magazine articles. Readers may also be interesting in joing others interested in the book at Facebook's Dark Green Religion fan site. It would be informative and even fun to plunge right into these online materials before reading the book. For the most part, however, it would be better to examine the online resources as you read the book, or afterward. Then all of these supplemental materials will make more sense. Please feel free to contact Bron Taylor directly with your own examples, comments, or criticisms.